We’ve been so good on the blog lately, featuring super-healthy salads, fresh produce and a new weekly nutrition feature that we figured it would be all right if we splurged a little. Cupcakes. They’re all the rage lately. It seems like a new cupcakery is opening every week in our Washington, D.C., neighborhoods and perhaps in your area, too. If you’re out of the cupcake loop, catch up with Cupcakes Take the Cake. To make the vanilla cupcakes, preheat the oven to 350, line a 12-cup muffin tin with paper or silicone cups and give each of those a little spritz of baking spray. In a bowl, combine 1 ¾ cup flour, 2 teaspoons baking powder and ½ teaspoon salt. Set that aside. Beat 8 tablespoons of unsalted butter (room temperature) with ¾ cup sugar. Add two large eggs (also at room temp) one at a time and 1 teaspoon of vanilla extract. Slowly add in half of the flour mixture, add ½ cup 1% milk and then the remaining flour until just mixed. Fill each muffin cup about 2/3 or ¾ of the way full and bake 20-24 minutes, until a toothpick comes out clean. Cool on a wire rack. While we love making things from scratch, Stacey claims one item that is just better out of a can is frosting. Chocolate frosting. But Sam says there is nothing like homemade frosting, especially vanilla or chocolate buttercream. Do “healthier” cupcakes exist? If you’d tried one of these recipes, please share! 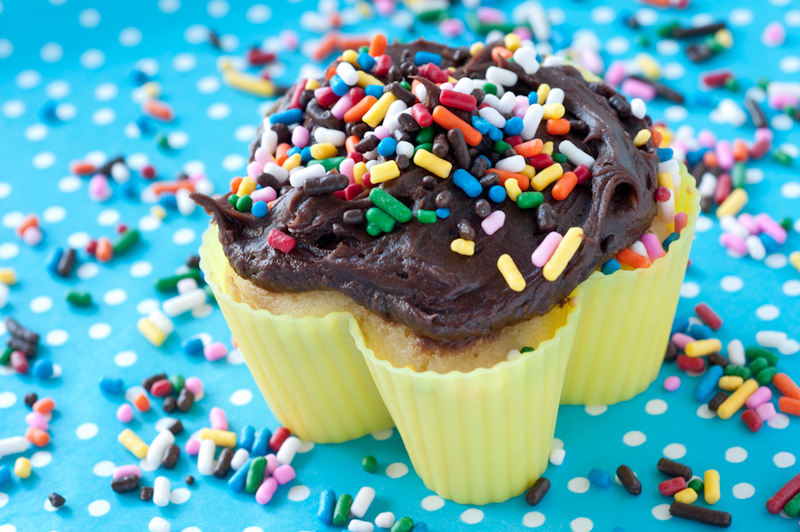 Do you have a frosting or icing recipe to share? Did you make these cupcakes with whole milk instead? How Stacey Got the Shot: ISO 100, 60mm focal length, f/11, ½ second exposure. Think you “can’t” cook? No more excuses! Sprinkles… jimmies… or chocolate vermicelli? Hey, what type of mold/liner is that cupcake in? I haven’t seen it before! Meg – That’s one of the flower-shaped silicon liners purchased in a pack of 6 for $1 at Target a few months back.